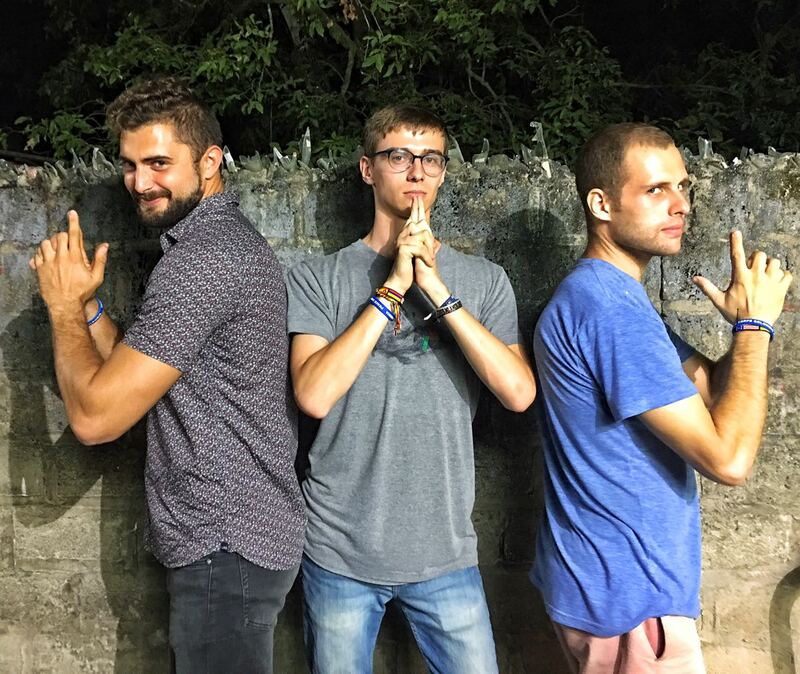 Cutter Ulhorn is a Practical English for Success (PES) volunteer serving in a pueblo in La Guajira, Colombia. Texas bleeds in and out. They do not tell you this when you are born. There is no talk when you are growing up, just on the verge of discovering yourself through the bodies of other people. No one sits you down and says, “This state that you were born in. This state is a stain. You are stained. And you will will leave, but all that you will ever do is pine for it and mourn for it.” I was betrothed, before I could speak. I could not protest. It was a decision made for me, and for everyone who has ever come into the world in a similar situation. At my birth, I was wedded to the state of Texas. Because all the world is Texas. Because those borders that were set down at the founding of the republic were just guidelines, and the frontera was just a suggestion, and really the border has been expanding for the past four hundred years. And you are in New York City, and you catch the waters of the Hudson out of the corner of your eyes and the brackish water becomes the emerald green of the Guadalupe, and you walk down some deserted highway outside of Riohacha, the hills scorched by wildfires, and for a second you are walking again through Big Bend. You see that time and space have conspired. You feel the well oiled leather of their chaos, the flaked steel of the spurs, the iron stud at the tip of their boots as you realize that you have been mounted by forces beyond your control, to lust for something always just beyond your reach. And now its bus rides through the desert, the sun pummeling the breakers, plumes of fog rolling down the mountains. Time, too much of it. So much time you feel trapped in it, can feel it expanding in your throat, in your lungs, until you are waiting out the seconds, bargaining for relief with a God who shines most when we shine least. There is no word for this type of boredom, which is both more and less than apathy, so much like anguish but tinged in hope, something like revelation. I hope for rest. I hope to be extinguished. I have known you all my life. I have known you for two years. You know me at my core. You have seen me exposed and between us there are no secrets. There is nothing between us but the calm that comes between building storms. You are so small. You are so fierce. You are childish and selfish, but it is so endearing, how you think the world revolves around you, and how it really does. How you walk into a room and it is brighter for you having been there, and everyone loves you. This small thing concerned with small things. Tiny erasers, the plight of cats, the moisture of a grain of couscous. This small thing that loves with a passion beyond her body. How you feel for things so deeply that the world is almost too much for you, and where others are driven to apathy and silence, you are driven to cry. It is as if you are always weeping. Weeping in terror, in sadness, in joy. You were always most beautiful with tears on your face. Memories of thing that will never be. A white house with a gate. A small kitchen. Cookies baking. The sound of laughter, a man and a woman’s. The texture of two lives commingling, of two hearts beating as one. A small child, with her eyes and my hair, running to the door. “Buy a finca and stay.” And this child does not know me, or if he knows me, only knows the myth of me passed around the pueblo, third hand knowledge of an inscrutable individual cloaked in the mystery of another continent and a middling grasp of Spanish. I look at him, his yellow eyes, expectant. He’s a child, but not stupid. How is this going to go down? The myth of me melding with the myth of here, the here I barely apprehend. I think of the wild hogs that roam the village at dawn, knocking over canecas of trash, eating dog feces and stray cats in the half light of morning and gone before the first Land Rovers fire up and head into the mountains. These creatures at once a part of the landscape and out of place, who take from the town in foreign and tasteless ways. I buy my finca from an old timer, I grow yucca at full yield against the other farmers, burning swaths of rainforest for fresh land every couple of years, hiding from the paramilitaries. Every six months I come into town, thin, sun scorched. I sit at the estadero and spend half of the money from my crop on a bottle of Old Parr and get drunk at noon and wander the single paved street in a daze, shouting at children, grabbing at women on their way to pick up their babies from the guardaria infantil, and finally passing out in a pool of my own vomit on the steps of the abandoned civil defense center, a halo of flies ringing my head. The men surround me, pick me up, throw me out on the caliche carretera heading into the mountains. See you again in six months. Rinse, lather, repeat for the rest of my life. I descend from the foreground into the background. I become the nuisance, the color commentary to a game of life with no clear winners or losers, just those with enough skin in the game to wake up each morning at the foot of the mountains and try again. In time I become the moral, and my myth is reupholstered In the new flesh of reality, the old timer hard on his luck. And my skin is burned black, my teeth yellowed from nicotine, my lips gnarled and cut. And it is in this moment that what this child is doing is asking me to double down and do what the Peace Corps has wanted to do all of this time. Integrate. He’s daring me to put my money where my mouth is and commit, so that I lose all of these things- my pride, my dignity, my sense of self- that keep me from being here, really here. For Him to increase, I must decrease. Speak and be heard. Speak but be silent. Listen to the air, to the nothing. What is the sound of nothing at all. If it really is nothing, how does it fill me. How can one be full of nothing. God speaks to us. He goes away. He walks the circumference of the earth. His feet are hurricanes, stabbing the sea. His head is a ring of solar flares. He is a nature and then more than nature. He walks and then we see him in wildfires, in floods, in rising rates of cancer. He does not speak, but he touches us. And His touch is a blow. His touch extinguishes our light. And our light is bright, too bright, unnaturally bright. He takes our light from us. He drowns us in what we are not and we are left choking on the floors of the present, our lungs on fire with the blood of His Son, our skin frayed and useless and peeling as we are exposed and denuded and seen for what we really are. Texas. You died before I was born. You died and I was born knowing you in memory. In the strange sounds of my father’s and mother’s mouth, the words that strolled on the promenades of their tongues, g’s dropped with an effete kindness, the vowels austere and red necked and bent over in fields of high cotton. I remember saying it as a child. Saying before I had seen television and my world was the four walls of our home and my head was filled with the voice of my parents. How it began as an exhale, almost a yawn, a wail that caught around the smothered wind of the o before crashing into the breakers of the v, trailing into the seafoam of a y barely audible, a euphonious grunt bubbling in the gale of my throat, a sound so elemental, that meant everything that was not me, you, a lovely and distant personage chloroformed by the storm of a child’s mouth. And now I stand in front of a class and speak these words to students. And my mind is filled with 25 years of cable TV and voices that clamor for the middle of the nation. It is not my voice. The words are spartan, barren. Saying just what they mean, and nothing more. I wonder if they care. Listen to me, I think. I don’t care if we ever speak in this language. Go home and burn your books. Chalk this class up to nothing, a waste of time. But please. What I would give so that you could feel what I feel when I think of my too small hands gripping a finger, looking up past legs and hips and breasts and shoulders into her brown eyes, saying these words I can no longer say just the same way. What I would give for you to feel this loss. To feel this loss is the most important thing in the world. You have been praying. You have been waking up early and committing yourself to sit at the desk in the corner of your rented room, your eyes still full with sleep, and commit yourself to speaking into silence. You speak into silence the name of the day and your desires and your fears. The desires you have are callous, your fears are shallow, and you have been filled with a nameless dread as you attempt to decipher what it means that when you cast the net deep into the gulf of yourself, you pull back nothing. The world isn’t broken, not yet at least. Just busted, revolting in its endless capacity to lie unfixed. Asking God to fix this is like asking him to fix you, and you gave up on that a long time ago, as it became apparent that he was going to do with you what he wanted, irrespective of what you wanted, and that words spoken at him were just a grappling with the way things would be, and that faith would be better served by being surprised with what happened and unsurprised with consistency, with the diligence of saying yes to life, whose syllables are the same as humiliation. Your words are a loaded gun and your wants spin in them as a chamber, the bullets nuzzling the length of the barrel, hollow pointed and groggy, steel tipped calipers measuring the width of day and night and Son and Father and dread. Maybe when we speak, we hold back what we must say for what is easier, and hamstring our words and send them lifeless from our mouths like the carcasses of so many horses, red and sorrel and white, whipping in the rapids under the myrtles of conscience, God smiling and knowing and crying and knowing, his intelligence termed and blessed and your mouth raw from not asking, from holding back in the corner of dark rooms, sequined and black laced and lost in thought. You prayed and you prayed and the egg timer reached thirty minutes and you stood up before the bell rang and silenced it with your fist, wrenching its nose back to the center of its face. You walk. You walk out of your rented room and into a kitchen, where you sit again and contemplate an open drawer of cutlery. A knife is missing, a spoon handle bent back dangerously. You think of swords plunged into stones. You think of storms tossing the mane of the sea. How is it that discovery is accompanied by disgust. You ask to see yourself and what is revealed is your defeat. You ask to be His hands and His feet and what you see are your limbs leprous and rosy with sores. Texas is a dream. It exists especially in those moments when we need it most: in pain, in trial, in sadness. When we seek an escape, there is Texas, as big and as grand as it was in 1845. For in it echoes the promise that in upheaval and in rebellion and in patient endurance can come the fruits of greater things: the depths of prosperity and the unburdening of guilt. To be apart from Texas is to find oneself always dreaming. For to depart from it is to leave that sense of pioneering that radiates through the everyday. It is to lose a purpose that drips like nectar from every minute. Boredom is not merely boredom in Texas, but an invitation for grander adventures. It is a grace to those who call it home. To lay aside their burdens for the moment, prop their head against the saddle, and sleep. I might be broke. I might not have anything in the world. But I am Texan. And though Texas is not eternal, and like all kingdoms of the earth will disappear, it is for this moment a richness, an unmerited coalescing of joy and disaster, of desolation and crowds of people, crying in many languages and one voice for a bright and lasting future, however long it may be. To be in Colombia is to find oneself departed from the pioneer. The country is wild. The festivities wilder. The Amazon laps at its southern base, as impenetrable as it was at the beginning of time. The jungles of the Sierra Nevadas are dense, unexplored. Even the Magdalena is a body to rival the Mississippi, overrunning its banks, destroying crops and homes, even conjuring visions of The Virgin amidst its muddy waters. But the spirit does not exist here. The frontier has been dead for years. We come upon its corpse, and we recognize its bones in the smiles of the people, in their listlessness, in their unflagging sentimentality and passion. And even bones are worth something. The relics of saints are worth visiting, not for the magic of their owners, but for their having lived at all: The improbability of a record of their survival through centuries of turbulence and violence and neglect. And this is worth celebrating, to find in another so far flung the marks of a kinship denied by place and by time. And to remember that miracles exist in this world, and that what once was dead can take on new skin and live. And this is what being in Colombia is, a dream, a waking dream of Texas: mesquites and ranch land, of drawling vowels and glittering cities erupting from the coastal bend. And it is a vigil, a waiting with others around the bier of a spirit mortally wounded by years of suspicion and needless death, waiting, with bated breath, for the inevitable, for the sleeper to open his eyes, pick up his bed, and walk into that throng of voices calling out into eternity. I am walking to Texas. I am heading down the Troncal and into Bolivar and Sucre and Cordoba, to the Darien Gap. I am leaving everything I own at the water’s edge and casting myself into the sea. And I will float up the coast, until the tortured waters of the Caribbean turn into the Gulf. The air will be cool, the breeze stiff with the scent of salt and gulls and oil. He is waiting for me on the shores of Texas. He is waiting on the shores of the land as cruel as it is beautiful, that has brought death and humiliation but life and life abundant. And so it is that Texans are ashamed of Texas, but it is a shame that blossoms into hope. The hope of knowing the goodness that lies coiled and sleeping next to evil in the hearts of man. He waits for me on this shore. His smile is as big as the sea. I call out to Him from the waters and he hears me. He throws a net into the water and the fibers circle me and for a second I am brought beneath the waves into the algae streaming in the current. My mouth fills with water. I am about to scream, when I resurface at the shore; stuck in the net. He comes and opens the net and lays hands on me and pulls me from the net. I turn around and see that in the net writhe the wet and naked bodies of thousands of men, their limbs choked on one another, gasping, coughing stumbling on the beach. He looks down at me. And where there was a smile, there is now a grimace, serious. Where is your fruit, where is your fruit. And he looks at me. I look into his eyes and wonder if they ever knew me. I look behind me. There is a fire. A thousand branches are burning to ashes. The sun is red overhead. It is setting into the sea.